This article is about the school in Dublin. For the school in Washington, D.C., see Gonzaga College High School. For the school in Spokane, Washington, see Gonzaga University. For the school in Jakarta, Indonesia, see Kolese Gonzaga. Gonzaga College is an independent Catholic boys' secondary school in Ranelagh, Dublin, Ireland. Founded in 1950, Gonzaga College is under the trusteeship of the Society of Jesus (the Jesuit Order), one of five Jesuit schools in Ireland. The curriculum is traditional, with a broad general programme of subjects including Latin and Greek at junior cycle and the opportunity in senior cycle to study eight subjects for the Leaving Certificate. . The school is named after the early Jesuit Saint Aloysius Gonzaga and takes its emblem from the coat of arms of the Gonzaga family. The school has a liberal, intellectual, and Jesuit ethos and its pupils must be Catholic and live south of the River Liffey. The annual fee for the 2010–2011 academic year was €5,800. 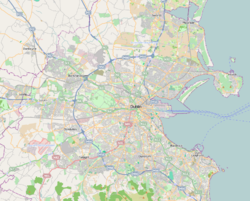 The school is located 3.7 km (2.3 mi) from Dublin city centre on a large area of land including a front lawn with cricket crease, rugby pitches and tennis courts. The school buildings include a library, chapel, clock tower, theatre, priests' residence, science block, and 84 individual classrooms. The architecture of the school mixes modern copper-roofed buildings with older period houses. Some sections of the school grounds were sold to developers for housing estates in the 1980s and 1990s. In 2007, the school began to work on a major extension project, increasing the size of the school building by 84%. The new building opened to students for the 2009-10 school year. Gonzaga College has a reputation for academic excellence. The use of examinations to select pupils for admission has been discontinued following government intervention (the state part-funds the school by paying some teachers' salaries), although boys and parents are interviewed ("the interview is a sharing of ideas"). In 2005, the school sent 68% of its Leaving Certificate pupils to University College Dublin and 21% to Trinity College Dublin. The school was ranked fifth in Ireland in terms of the number of students who progressed to third level. Visual arts, theatre, and music are emphasised in the curriculum; pupils are encouraged to study Latin and Greek. The primary sport focused on in Gonzaga is rugby, however many other sports such as tennis, golf, cricket, ultimate frisbee, badminton, milkball and athletics are also played within the school. The Junior Cup Rugby teams of 1989, 2003 and 2006 reached the final of the Leinster Schools Junior Cup. The Senior Cup Team (SCT) have often reached the quarter finals of the cup and have reached two semi finals, the rugby team of 2019 reached the final of the Leinster Schools Senior cup for Gonzaga's first time. They have, however, won the Senior League (for middle-ranking schools) on several occasions. The school has produced a small number of professional rugby players and seven Irish internationals: Tony Ensor, John Cooney, Barry Bresnihan (who went on to represent the British and Irish Lions), Padraig Kenny, Kevin McLaughlin, Dominic Ryan and Matt Healy. In 2008, the SCT captured the Vinnie Murray Cup after their second time in the competition, beating Cistercian College, Roscrea 19-7. They repeated this success in 2010 defeating CBC Monkstown 11-10. The school golf team won Leinster titles in 1999 and 2006. Previously, the team reached the semi-finals of the junior cup. In 2010, the Senior Team won the Leinster Schools Senior Matchplay competition, beating Blackrock College 3½ to 1½. They went on to win the All-Ireland Golf Championship in April 2010. The main sports in the College during the summer term are lawn tennis and cricket. Gonzaga has a strong tennis tradition, producing many of Ireland's finest tennis players including Barry King, Seán Molloy and Jerry Sheehan. In recent years, players such as John Morrissey (Stanford University) and Osgar Ó hOisín (University of Wisconsin) have received tennis scholarships to the United States. The college has also produced three cricket internationals, most recently bowler George Dockrell. Gonzaga College has a tradition of strong chess teams which have been victorious in numerous Leinster and national championships. The junior and senior team won both the Leinster and All-Ireland Championship in 2009, a feat they repeated in 2011. In 2012, 2013 and 2014, they were Leinster and All Ireland champions at minor, junior and senior levels – an unprecedented clean sweep of Irish schools chess. Of the school chess teams' many achievements, most noteworthy was winning the prestigious Millfield International Chess Tournament in England in 1992, 1999, 2014, 2015, 2016, 2017 and 2018 while also winning the Eton College Rapidplay in 2016. Many school chess players have built on their experiences at the college and after graduating continued to greater success, including International Masters Sam Collins and Mark Quinn. Gonazga Chess Club, which includes pupils and adults competes in the Leinster Chess Union leagues, with the club being very successful in recent years, winning the first division Armstrong Cup 2015, 2016, 2017 and 2018. Initially the school consisted of the three Bewley buildings on the site, one being used for the school, one as a Jesuit house of residence, and one as a lunch room, changing rooms, science laboratories, etc. In the 1950s Andrew Devane of Robinson Keefe Devane Architects prepared a masterplan with a school hall between the two main houses and classroom wings extending to the two main houses. The masterplan included a chapel in front of the hall and main entrance. Over the 1950s the classroom wing linked to the school house was built along with the hall and main entrance. In the 1960s the chapel was built. In the 1980s an additional wing of classrooms was constructed. The school's renovation project finished in time for the 2009-10 school year: the first stage was a complete renovation of the science facilities, while the second stage almost doubled the floor area of the school with new buildings. The extension included the new Purdy Dining Hall, the new Coulson Theatre, a gym changing area, and classrooms. The old school hall was completely renovated into a modern library named the Sutherland Library with meeting rooms and study facilities. Jack Gleeson - actor, notable for his role in Game of Thrones as King Joffrey. Aidan Mathews — poet, dramatist, novelist. Michael McDowell — Tánaiste, Minister for Justice, Equality and Law Reform and Attorney General of Ireland. John Dudley-Professor of philosophy, University of Leuven. George Dockrell — Ireland national cricket team and Somerset County Cricket Club cricket player. ^ The Characteristics of Jesuit Education Archived 2010-06-02 at the Wayback Machine. Seattle University. Retrieved: 2010-09-03. ^ The Characteristics of Jesuit Education. World Union of Jesuit Alumni(ae). Retrieved: 2010-09-03. ^ Kerrigan, Gene (2011-05-01). "I'd love to be a judge, if I had the Latin". Sunday Independent. Archived from the original on 2013-02-17. ...the school takes only practising Catholic boys, who "must be resident south of the River Liffey". No northsiders need apply. This might be defended as relating to proximity to the school -- but northside Drumcondra and East Wall are closer to Gonzaga than are southside Killiney and Dalkey. ^ Kerrigan, Gene (2011-09-25). "Furthering inequality in divided society". Sunday Independent. Gonzaga College, for instance, has a no-northsiders-need-apply policy, stated openly. You have to live south of the Liffey. ^ Private schools: Pupil numbers and day fees, Independent.ie, 2014-09-17. Retrieved: 2015-11-22. ^ Wikimapia Distance measured precisely to G.P.O. as crow flies. ^ Admissions policy: (E) Decision making, gonzaga.ie. June 2010. Retrieved: 2010-11-29. ^ "High School ranks top in State, says new league table". Retrieved 12 November 2018. ^ Short game by Shay Keenan, The Irish Times, 2010-02-16. Retrieved: 2010-09-01. ^ Aidan Mathews, Ricorso. Retrieved: 2012-01-06. ^ Photo Gallery Archived 2011-08-17 at the Wayback Machine Gonzaga Union. Retrieved: 2011-11-18. ^ Inaugural Benevolent Fund Event Archived 2011-08-17 at the Wayback Machine Gonzaga Union. Retrieved: 2011-11-18. ^ Leading diplomat who worked as volunteer in Africa and India Irish Times, 2011-04-09. ^ Secretary-General Appoints Peter Sutherland as Special Representative for Migration, United Nations Press Release, 2006-01-23. Retrieved: 2010-08-25. ^ He's the last big hope for nation on its knees, Sunday Independent, 2008-06-29. Retrieved: 2010-08-25. ^ First among equals[permanent dead link] Sunday Tribune, 2002-05-26. ^ Bookie with luck of the Irish The Guardian, 2006-03-18. ^ David McRedmond: TV3 Archived 2011-10-03 at the Wayback Machine Business and Finance. Retrieved: 2011-11-18. ^ Barry Bresnihan Obituary The Telegraph, 2010-07-26. ^ "Latest climbs". Retrieved 28 January 2018. A Short History of Gonzaga College, 1950–2000, Christopher J. Finlay, Dublin, September 2000, Eneclann Ltd. ISBN 978-0-9537557-1-4. This page was last edited on 22 March 2019, at 22:21 (UTC).